The truth is still out there -- and it might be coming back! 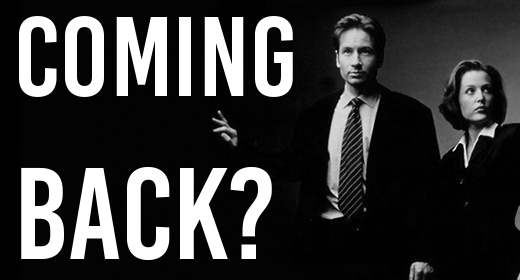 The truth is still out there — and it might be coming back! The truth is out there, and now we may get to look for it again! Remember The X-Files? You know, one of the greatest shows ever? Apparently Fox is considering bringing it back! Fox TV Group chairman Gary Newman spoke at TCA recently, and mentioned that he’d like to bring the classic show back. Beyond elaborating that he would also like to bring back original stars David Duchovny and Gilliam Anderson, he didn’t go into a lot of detail. For those of you too young to remember, The X-Files was a Friday night staple on Fox. The show followed two FBI agents as they investigated the Bureau’s strange and paranormal cases. The series spawned two theatrical movies, a spin off series, a cult following, and a wealth of merchandise. So how do you guys feel about this? Personally, I’d be pretty stoked if they brought this back with the original cast and did it right. Gimme a hollaback in the comments with your thoughts! Power Glove — (sort of) back from the dead!